Andrew Lloyd Webber’s Starlight Express, which has been playing at a purpose-built theater, the Starlighthalle, in Bochum, Germany since 1988, has upgraded video production using disguise to drive video for a refreshed run, making its debut this summer. Starlight Express is about a nine year-old boy’s dream in which toy trains come to life for a spectacular race across America. The long-running musical, performed entirely by actors on roller skates, includes new material and significant technical updates to the auditorium. The Starlighthalle in Bochum features tracks on three levels in a U shape with the audience sitting in the middle and around the tracks. Video is projected over the entire set, including the skating floor, arches, and back wall. 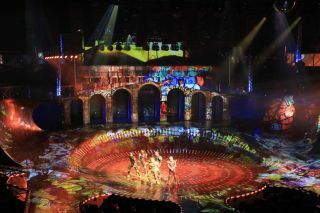 The video projections take the audience to each scene location and provide graphic backdrops for some of the show’s numbers. Duncan explained that using the disguise pro range was the logical choice for the complex needs of the production. “Given the heavy 3D mapping that the production required, we felt no other media server would have given us the technical flexibility and support we needed. The 3D previs function always makes the whole process so much quicker—it gives you a great idea of what will and what won’t work in the space. According to programmer Emily Malone, disguise’s QuickCal “was a feature we heavily relied upon. One of our mainprojection surfaces is the floor, which is quite a complicated set of curved surfaces covered by 12 projectors. With QuickCal what would have been a difficult and very laborious focus is now a very straightforward methodical process. Salvador Avila and Ethan Forde are the system engineers with the production, Gustaf Lindströmthe lead animator, and Stanley Orwin-Fraser, Bradley Purnell, and Alex Uragallo the animators.